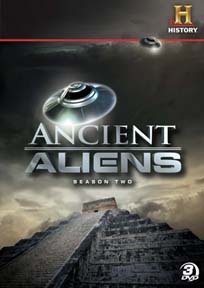 Season Two of the History Channel’s popular television show ANCIENT ALIENS continues the search for evidence of extraterrestrial interaction with humans. Ancient cave drawings of strange creatures, remains of landing strips in Peru, and Indian texts that describe the 'flying machines of the gods' were just a few of the odd archaeological artifacts cited as proof that ancient astronauts were well known to our ancestors. Produced with the exclusive cooperation of Erich von Daniken himself, in Season Two, launched even more all-new expeditions to seek out and evaluate this evidence. It is a balanced investigation into a theory some believe cannot be true, but many agree cannot be ignored. Includes interviews with David Hatcher Childress, Giorgio Tsoukalos, Christopher Dunn, Philip Coppens, Graham Hancock and many others. Includes all ten revealing episodes.